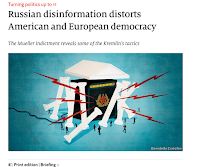 Russians, Elections & Mueller – Oh My! 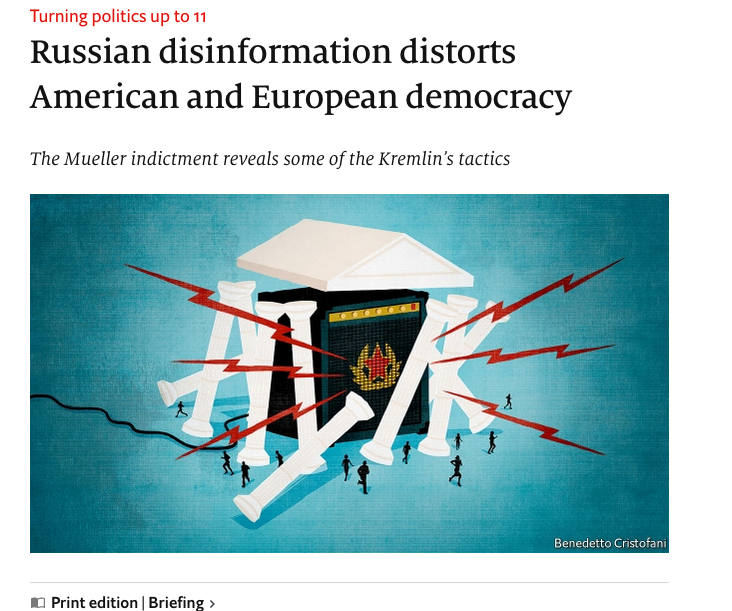 You cannot pick up a newspaper or listen to a news broadcast today without hearing something about how the Russians influenced the 2016 US presidential election. The barrage of news and commentary surrounding the disinformation operations is overwhelming. We all know that there are PSYOP lessons to be learned buried in there and I thought the time had come for me to at least start pecking away at them. When I face complex international events I turn to the Economist as an impartial source. Since they are not a US publication they can, and do take liberties in the way they report and analyze the news. The article notes “three companies Mr Prigozhin controlled, including the Internet Research Agency (IRA, see article), and 12 other named Russians with identity theft, conspiracy to commit wire and bank fraud and conspiracy to defraud America by “impairing, obstructing and defeating the lawful governmental functions of the United States”. Identity theft stood out to me. Identify theft implies that the perpetrators used the identities of real people as well as fictitious people in their social media ruses. This is the very essence of Black Propaganda that either uses false sources or obscures the true source. Fake social media personas were employed to reduce voter turnout among blacks and Muslims, while encouraging votes for Bernie Sanders to decrease Hillary Clinton’s vote count. The false personas were then able to mobilize “unwitting members, volunteers, and supporters of the Trump campaign” largely because the false persona’s appealed to the already existing beliefs and bias of those people. The article goes on to say that “Social media are designed to hijack their users’ attention. That makes them excellent conduits for the dissemination of lies and for the encouragement of animosity.” This employment of social media shows a deep recognition of intended and unintended consequences of it. 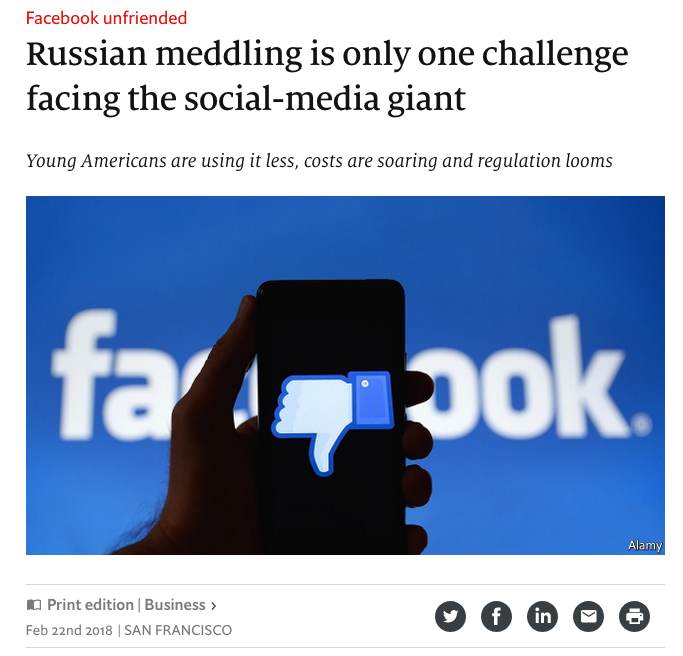 The second article I referred to was in the same issue and entitled “Facebook unfriended” and subtitled “Russian meddling is only one challenge facing the social-media giant” (see: http://econ.st/2FJB62j, which is also a photo source). 2. FaceBook will not be as influential for any subsequent disinformation campaigns targeted at people under the age of 25 because it is losing significant ground to SnapChat and Instagram among others. For we in the PSYOP Community the message is clear – stay on top of the latest in social media and technology, view them with caution and never loose sight of how even the oldest of influence tactics still work. As always reader comments are encouraged.